The life of Camilla Stodgell Wigle has been long and extremely interesting. Born on Lincoln Road in Walkerville in 1901, Camilla is the youngest of the three children of John and Emma Stodgell. Over the last few months, I have had the opportunity to speak with this charming lady on several occasions. Aside from being a surviving resident of the Walkerville area in the years just after the death of Walkerville's founder Hiram Walker, the fact that Camilla has lived through ten decades of incredible technological change is mind boggling. When I conveyed a sense of this to Camilla, she agreed. "Yes, I've lived in a wonderful era. I have been so lucky to have seen so much and to have done so much, and I'm happy I can remember so much of it. " Camilla's parents operated three businesses in the Flat Iron Building (torn down in 1995), located across from the main office of Hiram Walker's & Sons on Riverside at Devonshire Road. Their popular tea room, confectionery and china shop kept her parents extremely busy and young Camilla and her two brothers helped out wherever they could. Camilla was often responsible for getting dinner ready in The Big House, the large family home built by her father, though vastly changed, still stands on Riverside at Strabane across from Central Park Lodge. And, every Friday afternoon, beginning when she was just ten years old, Camilla would operate the family car for her dad, a non-driver. 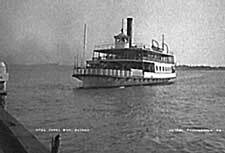 She would steer it on to the Walkerville Ferry and the two would head to Detroit. There, they would pick up ingredients her father, who had been trained in England, required for the delicious confections and ice creams he made later at his store. "The police officer on the corner of Woodward and Jefferson," Camilla remembers during a recent visit to her home in Riverside, "called me 'the little girl with the curls'. When he saw me coming, he would hold up his white gloved hands to stop the traffic and I would carefully drive around the corner." As for whether she needed a driver's license, Camilla explains, "Driver's licenses weren't required then since there were so few cars! My dad owned the first car that came off the assembly line in Ford City. It wasn't until cars began to be more common that the need for licenses was recognized." 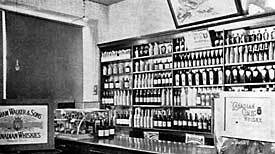 Camilla's Uncle Charlie Stodgell, Mayor of Walkerville for three years, owned and operated a wine & spirits shop also located in the Flat Iron Building. In addition, he was involved in labelling Hiram Walker products. Camilla remembers, as a little girl of 5 or 6, helping to label the bottles. The Flat Iron Building, named because its shape resembled a clothing iron, was large enough to accommodate a 600 seat auditorium and reading room on the second floor as well as a variety of other shops on the main. "Next door to my father's set of shops was the Canadian Telegraph Office" recalls Camilla. "People were fascinated to see the operator tapping his messages. They would peer through the window for ages. Next to him was Johnson's Butcher Shop. Children loved him because he was so kind and he gave them frankfurters. Charlie McFarlane's Grocery Store was next and on the end was a shop that manufactured parts for the first 'Reo' automobile." Camilla's brother Simeon was one of the first stockbrokers in Windsor and continued to work at his brokerage Midland Walwyn, until shortly before his death last year at 103. Her other brother Charles, more commonly known as "Chick", died several years earlier, and was well known because he was the only compass adjuster and boat surveyor in the Detroit River and Great Lakes region. Camilla attended both St. Mary's Academy's (the original school located where the tunnel is now situated and the second school, also torn down, in South Windsor) and graduated from Havergal College in Toronto in 1921. She was also a trained singer and an accomplished harpist. She performed often and, at seventeen, played for the Prince of Wales when he was the honoured guest of the City of Windsor. Camilla drove with her dad to many of her performances: "My dad would carefully set the harp on the running board of the Ford. I would drive of course, and he would hang onto the harp through the open window!" Camilla met her husband John Wigle at the dance school organized by the mothers of Walkerville. Annie Ward Foster had been teaching the offspring of the Fishers, Fords and Dodges in Detroit and agreed to also instruct the young ladies and gentlemen of Walkerville in ballroom dancing. The dance school was set up on the second floor of a building at the corner of Wyandotte and Windermere but was moved to Wyandotte and Ouellette due to lack of room. At the end of the dance season, a final performance was always held in Detroit. One year, Camilla led the Grand March with Edsel Ford. Camilla's husband John was elected the first mayor of Ford City (just east of Walkerville) at the age of 29 and was the youngest mayor in Ontario at the time. Camilla, who was 25, was known, unofficially, as the First Lady of Ford City. They had two children, Elizabeth Camilla and John Whitcombe. Unfortunately, like so many others, they lost nearly everything during the Great Depression. "For ten years we struggled," recalls Camilla. "I don't know how we got through it but I guess we just kept thinking that one day, things would get better." Things finally did improve and John got the opportunity to launch a business called Wigle Propane. At 57, he met an untimely and tragic death and Camilla was left the business, which she ran successfully for many years. Camilla has been actively involved in many Windsor organizations over the years. The Windsor Symphony has long benefited from her enthusiastic support and she is a life member of Canterbury College. Camilla did eventually receive her driver's license and up until 96, continued to drive. As for words of to live by, Camilla advises, "Never give up! I know there is still a lot to do in the world for me!"